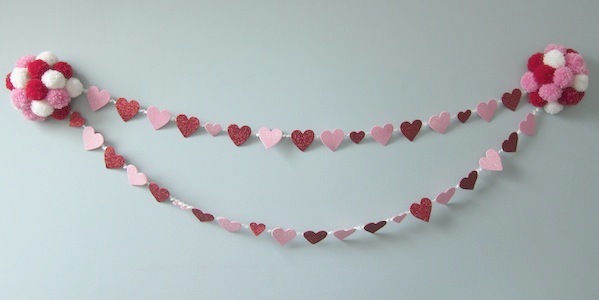 I bought a bunch of glitter hearts at the dollar store a few weeks ago with the idea of turning them into a garland for Valentine’s Day. I wanted to add something other than hearts though. I had a lot of white, pink and red yarn in my stash, so I thought why not pom-poms. Instead of stringing the pom-poms with the hearts, I made pom-pom balls to anchor each end of the garland. I think it is so fun and festive. 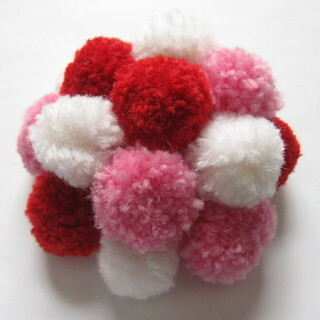 You could make the pom-pom balls in all sorts of colors to use with different garlands for other occasions too. 1. 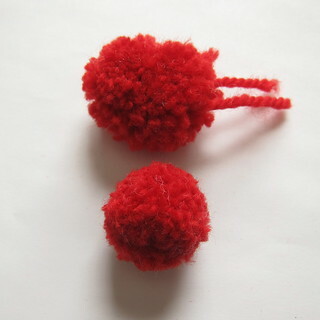 Either buy or make approximately 32 3/4 – 1 inch pom-poms. The number you need will depend on their size. I made mine using the fork method. I used worsted weight yarn wrapped 60 times. Now not all worsted weights are the same, ones that are a little thicker make a plusher pom-pom. They come out a little misshapen when first off the fork, but trimming will make them look round and full. 2. Use the serrated knife to cut the styrofoam ball in half. 3. 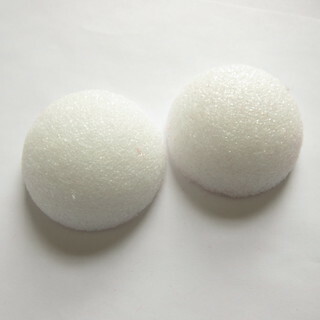 With the styrofoam glue, start covering the ball halves with the pom-poms. I found it was best to start around the edge and then fill in. Use a generous amount of glue and let them dry all day or overnight. 4. Cut one or two lengths of yarn the length you want your garland with about 4 inches extra on each end. 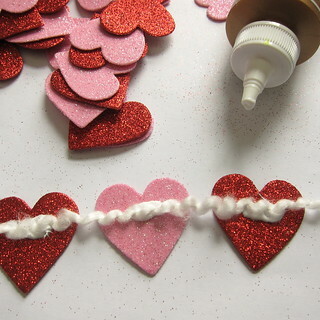 Glue hearts along the yarn. I used tacky glue for this. 5. Pin or glue the ends of the yarn to the back of the pom-pom balls. 6. 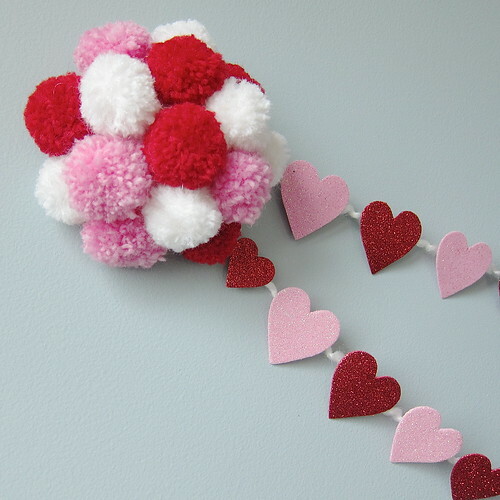 The garland can be hung by sticking the styrofoam balls onto hooks or nails in the wall. 6 years ago by Kat in Craft Projects , Crafts , Holiday , Projects , Valentine's Day | You can follow any responses to this entry through the RSS feed. You can leave a response, or trackback from your own site. That turned out super cute. I love it. How adorable! Love the idea of using the styrofoam ball and the pom poms! Cute!